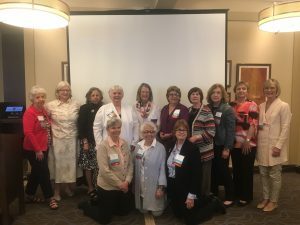 Mary Ann Ashton, Acton Area League, and Linda O’Connell, Springfield unit of the Northampton League, were elected co-presidents of LWVMA for the next two years. The other officers are treasurer, Andrea Kozinetz, Newton; secretary, Shelley Drowns, Waltham; first vice president, Marilyn Peterson, Acton Area; and second vice president, Lee Bona, Worcester Area. LWVMA directors are Kate Boland, Hingham; Roz Broch, Williamstown; Nancy Brumback, Sudbury; Jean Cherdack, Northampton Area; Scotti Finnegan, Cape Cod Area; Donna Hooper, Lexington; Kris Eastman, Rochester-Marion-Mattapoisett; Karen Price, Needham; and Judy Zaunbrecher, Concord-Carlisle. The off-board members of the state nominating committee are Wendy Manz, Lexington, chair; Sharon McCarthy, Harvard; and Ellen Goguen, Grafton. LWVMA salutes and thanks the women who are leaving the board: Marlene O’Brien of Wellesley, who was first vice president; Carole Pelchat of Greater Haverhill, who has been a board member and the League’s legislative director since 2006; and Launa Zimmaro of Concord-Carlisle, who has been a director and who continues as legislative specialist for environment and energy.